The design has been unveiled for Barack Obama‘s new presidential center. Aside from unveiling a special Chicago-themed playlist, the Obama Foundation has released plans for Obama’s lakefront presidential center, showcasing renderings of the building on Wednesday. The renderings depict three buildings — a forum, library, and museum — which will surround a plaza that will be located on the South Side of Chicago. The center is slated to be complete by 2021. As for the exhibits that will be in the center, the same design firm responsible for creating the National Museum of African American History & Culture will be in charge of those. The design team will include several people that are native to Chicago (specifically the South Side of the city), such as artist Amanda Williams, as well as Andres Hernandez and Norman Teague. The team will be in charge of creating state-of-the-art interactive exhibits for the museum. 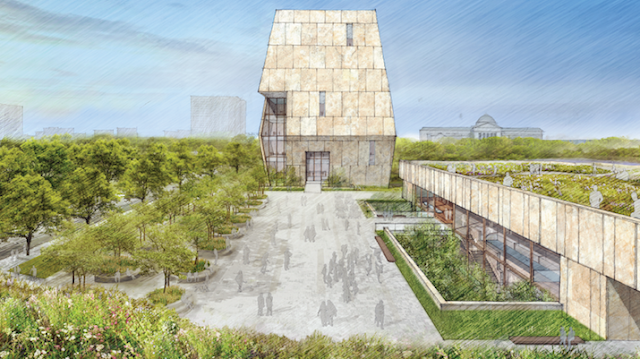 “We are honored to lead this incredible exhibition design team and to collaborate with the Obama Foundation to help develop a presidential center that reflects the dynamism and openness of the Obama presidency and encourages and supports civic engagement,” founder Ralph Appelbaum said.